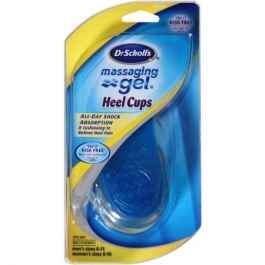 Dr. Scholl's Massaging Gel Heel Cups were designed in conjunction with certified athletic trainers to help prevent and relieve heel pain. They feature lightweight gel construction to provide stability and heel support. Remove film between heel cups. Place cup against inside back Of shoewith gel waves side down.